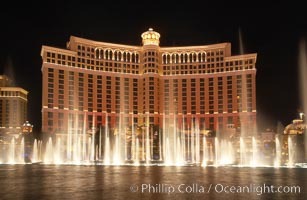 The Bellagio Hotel fountains, at night. The Bellagio Hotel fountains are one of the most popular attractions in Las Vegas, showing every half hour or so throughout the day, choreographed to famous Hollywood music. 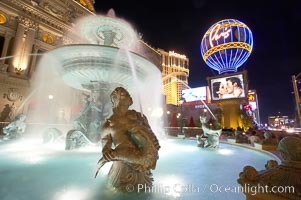 Las Vegas Photo. 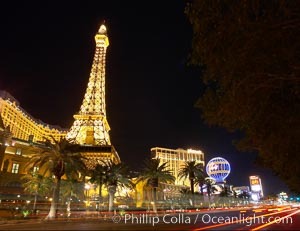 Half-scale replica of the Eiffel Tower rises above Las Vegas Boulevard, the Strip, in front of the Paris Hotel. Las Vegas Picture. 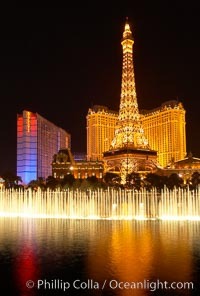 The Bellagio Hotel fountains light up the reflection pool as the half-scale replica of the Eiffel Tower at the Paris Hotel in Las Vegas rises above them, at night. Stock Photography of Las Vegas. 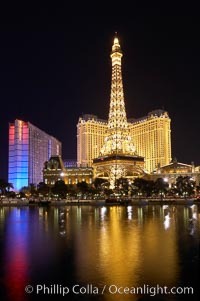 The Bellagio Hotel fountains light up the reflection pool as the half-scale replica of the Eiffel Tower at the Paris Hotel in Las Vegas rises above them, at night. Photograph of Las Vegas. Jasmine Restaurant and Caesar's Palace Hotel are reflected in the Bellagio Hotel fountain pool at night. Las Vegas Photos. 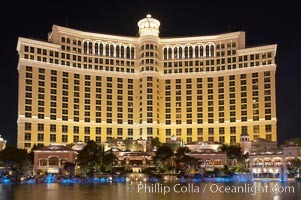 The Venetian Hotel rises above the Strip, Las Vegas Boulevard, at night. Las Vegas Image. 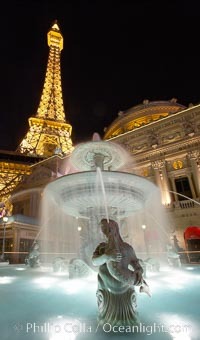 Fountain at night, Paris Hotel. Professional stock photos of Las Vegas. The Bellagio Hotel reflected in the fountain pool at night. The Bellagio Hotel fountains are one of the most popular attractions in Las Vegas, showing every half hour or so throughout the day, choreographed to famous Hollywood music. 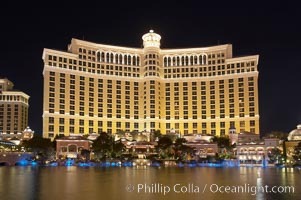 Las Vegas Photo. 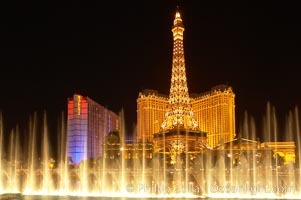 The Bellagio Hotel fountains light up the reflection pool as the half-scale replica of the Eiffel Tower at the Paris Hotel in Las Vegas rises above them, at night. Las Vegas Picture. The Bellagio Hotel reflected in the fountain pool at night. The Bellagio Hotel fountains are one of the most popular attractions in Las Vegas, showing every half hour or so throughout the day, choreographed to famous Hollywood music. Stock Photography of Las Vegas. 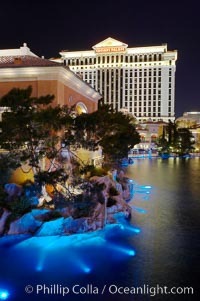 The Bellagio Hotel (left) and Caesar's Palace (right) reflected in the fountain pool, at night. The Bellagio Hotel fountains are one of the most popular attractions in Las Vegas, showing every half hour or so throughout the day, choreographed to famous Hollywood music. Photograph of Las Vegas. The Bellagio Hotel reflected in the fountain pool at night. The Bellagio Hotel fountains are one of the most popular attractions in Las Vegas, showing every half hour or so throughout the day, choreographed to famous Hollywood music. Las Vegas Photos. The Bellagio Hotel fountains, at night. The Bellagio Hotel fountains are one of the most popular attractions in Las Vegas, showing every half hour or so throughout the day, choreographed to famous Hollywood music. 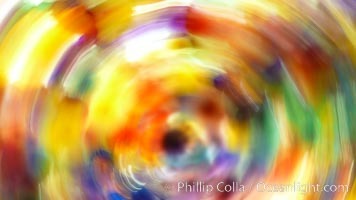 Las Vegas Image. 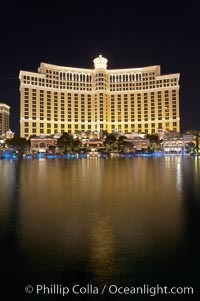 The Bellagio Hotel (left) and Caesar's Palace (right), seen behind the Bellagio fountains, at night. The Bellagio Hotel fountains are one of the most popular attractions in Las Vegas, showing every half hour or so throughout the day, choreographed to famous Hollywood music. Professional stock photos of Las Vegas. 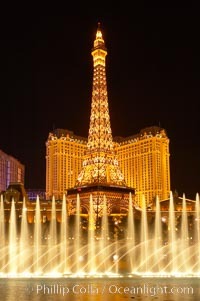 The half-scale replica of the Eiffel Tower at the Paris Hotel in Las Vegas is reflected in the Bellagio Hotel fountain pool at night. Pictures of Las Vegas. The half-scale replica of the Eiffel Tower at the Paris Hotel in Las Vegas is reflected in the Bellagio Hotel fountain pool at night. 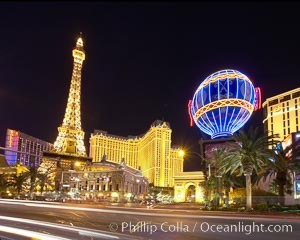 Las Vegas Photo. 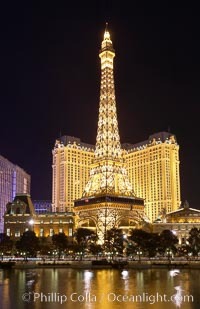 Half-scale replica of the Eiffel Tower rises above Las Vegas Boulevard, the Strip, in front of the Paris Hotel. Photograph of Las Vegas. The half-scale replica of the Eiffel Tower rises above a fountain at night, Paris Hotel. Las Vegas Photos. 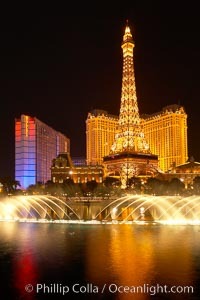 The Bellagio Hotel fountains light up the reflection pool as the half-scale replica of the Eiffel Tower at the Paris Hotel in Las Vegas rises above them, at night. Las Vegas Image. 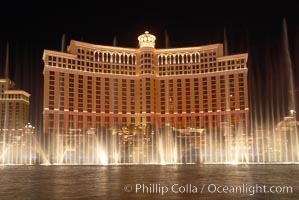 The Bellagio Hotel fountains light up the reflection pool as the half-scale replica of the Eiffel Tower at the Paris Hotel in Las Vegas rises above them, at night. Professional stock photos of Las Vegas. 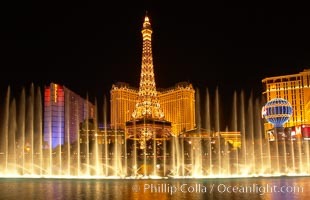 The Bellagio Hotel fountains light up the reflection pool as the half-scale replica of the Eiffel Tower at the Paris Hotel in Las Vegas rises above them, at night. 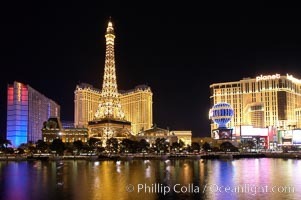 Pictures of Las Vegas. 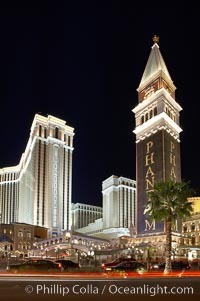 Photo of the Venetian Hotel and "Phantom"